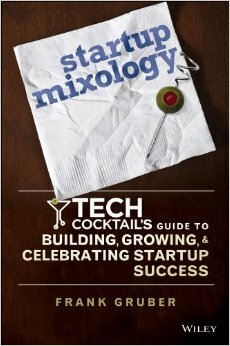 If you are startup looking for a little funding and guidance you might want to check into one of the incubator program like TechStars. Nestled just outside of Denver in Boulder, Colorado the TechStars program is in its second year and still accepting hungry startup founders for this years applicants. Throughout the summer program, founders can get up to $15,000 in seed funding, are surrounded by like-minded entrepreneurs, work in great space downtown Boulder, and are given access to learn from an line-up of fabulous mentors. Apply today - the 2008 deadline is March 31, 2008. Brightkite lets you make friends, join communities, and share experiences on the go. People. Places. Connections. In real time. That's Brightkite. EventVue helps conference organizers by providing an online community for the event and driving new conference registrations. Filtrbox is a new web service that tracks and monitors new media content and news for small to medium businesses, as well as individuals. Filtrbox helps you stay in the know and up-to-date on your attention stream with minimum set-up and maximum benefit. Filtrbox demoed at TECH cocktail Boulder. Intense Debate replaces your standard blog comment system with a completely new tool for conversation. With Intense Debate, your blogs community comes alive. J-Squared Media is focused on social communication platforms and emerging technologies. Their applications are installed by millions of users on the most popular social networking systems. madKast makes sharing blog posts simple and delivers detailed blog analytics to publishers. Search-To-Phone voice-enables the outdated yellow pages process by recording consumers' specific needs then broadcasting that recording to all local merchants simultaneously by phone. Tell the world what you're looking for and you're bound to find it. It’s live, local, mobile search. socialthing! is a digital life manager that puts what you do online into one place. See everything that's going on with your friends in all the sites you use, post stuff to multiple places at once and more. socialthing! demoed at TECH cocktail Boulder. Villij is a recommendation engine for people. It learns who you are based on the content you create, and then introduces you to others. 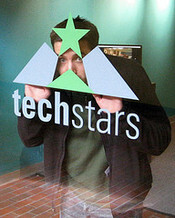 I was in Boulder a few weeks ago for TECH cocktail Boulder and got a chance to swing by the TechStars office to chat with Executive Director, David Cohen. David gave me a quick office tour and I was pleased to see SOMEWHAT FRANK showcased on the office wall. 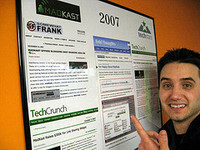 Included (below) is the TechStars Office Tour Video which is the latest SOMEWHAT FRANK TV video podcast episode. For similar programs you can also might want to read the article on TechCrunch recently highlighting Y Combinator, a Silicon Valley program. LaunchBox Digital just recently formed in Washington, DC and accepted applicants up to last week and Brian Williams offers more details on both TechStars and LaunchBox.